Hobby Lobby often has great sales for 50% off or more, but some of their craft items don’ t tend to go on sale as often. 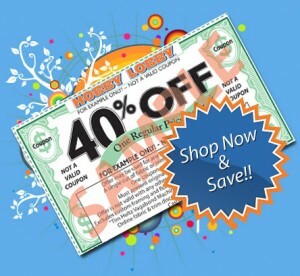 If you need an item that doesn’t go on sale often (or just want something that is full priced) you can use this printable coupon to get 40% off one item! If you’d rather shop online, you can use the coupon code 9462. Shipping starts at $5.95. If you’ve never been to Hobby Lobby, they have great prices on fabric, craft items, decor, and seasonal items!